<h2>A ‘cookbook’ for vehicle manufacturers: Getting automated parts to talk to each other</h2><br /><p>Automation will increasingly allow vehicles to take over certain aspects of driving. However automated functions are still being fine-tuned, for example, to ensure smooth transitions when switching between the human driver and driverless mode.</p> <p>Standards also need to be set across different car manufacturers, which is one of the goals of a project called&nbsp;<u><a href="https://cordis.europa.eu/project/rcn/210915/en" target="_blank" rel="noopener noreferrer">L3Pilot</a></u>. Although each brand can maintain some unique features, automated functions that help with navigating traffic jams, parking and motorway and urban driving must be programmed to do the same thing.</p> <p>‘It’s like if you rent a car today, your expectation is that it has a gear shift, it has pedals, it has a steering wheel and so on,’ said project coordinator Aria Etemad from Volkswagen Group Research in Wolfsburg, Germany. ‘The approaches and the interfaces to the human driver are the same.’</p> <p>To get the same functions from different brands to operate in an identical way, the team is creating a code of practice. This will result in a checklist for developers to run through when creating a self-driving function. ‘It’s like a cookbook for how to design and develop automated driving functions,’ said Etemad.</p> <p>So far, the project team, which includes representatives from 13 vehicle manufacturers, has been conducting initial tests to make sure their company’s technology works. Cars are equipped with several sensors as well as cameras and computers which need to be properly calibrated to deal with real-world traffic.</p> <p>The next step is to test the automated functions on public roads to ensure that the vehicles are ready. The tests will begin this month. Volunteer drivers will be chosen from diverse backgrounds, including different ages and genders. ‘We plan, all in all, to have 1,000 drivers using 100 vehicles in 10 different countries,’ Etemad said.</p> <p><strong>Transition</strong></p> <p>The technologies being trialled will cover a wide range of situations from&nbsp;overtaking on motorways to driving through urban intersections. Long journeys are also planned to see how people are able to transition back to driving after a long time in automated driving mode.</p> <p>‘We really want to understand if the way we have designed our systems is the way drivers expect them to behave,’ said Etemad.</p> <p>The team will also be investigating other aspects of automated driving such as the effect on traffic flow and CO2 emissions. Self-driving features are likely to make driving more efficient due to connectivity between vehicles and infrastructure, for example, although research so far has shown mixed results due to other contributing factors such as more people choosing to drive.</p> <p>The first automated functions, which should be available in the next year, are likely to be for motorway driving, according to Etemad. Parking functions are likely to come to market next followed by automated urban driving, which is much more complex due to additional elements such as pedestrians and cyclists moving around.</p> <p>‘There will be a good contribution from the project with results about long-term automated driving and a general understanding of people and functions that will impact how these systems are developed,’ said Etemad.</p> <p>Automated functions are of interest for trucks too, where networked vehicles driving in a convoy could help save fuel, cut down on driving time or help with traffic flow. 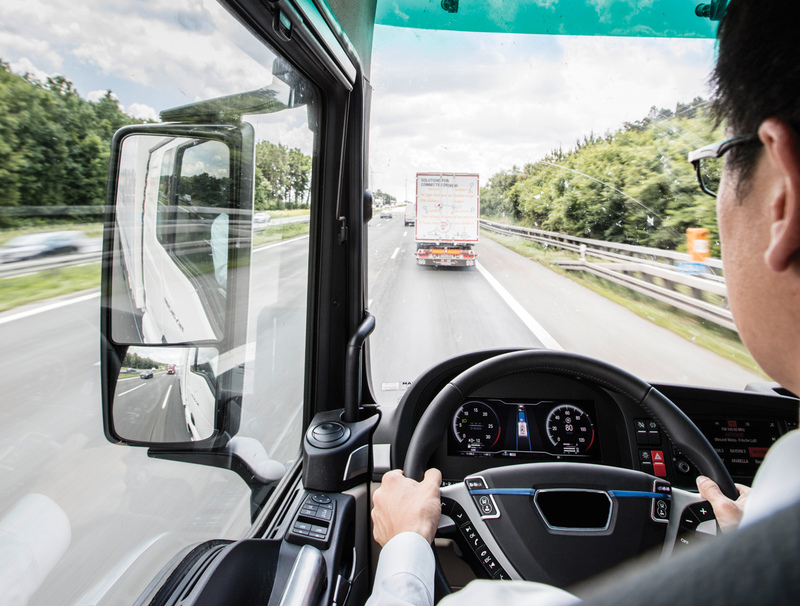 Truck platooning involves several trucks linking up through a wireless connection when they are close by so that they can share information and use automated functions to drive together as one. But so far, the concept has&nbsp;mostly been demonstrated in trucks of the same brand and in very few cases, with <a href="https://www.saferresearch.com/projects/sweden4platooning">two brands</a>.&nbsp;</p> <p>‘Each automotive manufacturer tries it out and develops the technique within their own factory,’ said Dr Marika Hoedemaeker, a senior project manager at the Netherlands Organisation for Applied Scientific Research (TNO) in Helmond.</p> <p> <div class="quote-view quotesBlock quote_horizontal"> <div class="quotesTop"><img src="https://horizon-magazine.eu/sites/all/themes/horizon/images/quotes_top.png" alt="" title="" /></div> <p>‘It's not only communicating with the platoon (of networked trucks) but also with the outside world.’</p> <blockquote><p>Marika Hoedemaeker, senior project manager, Netherlands Organisation for Applied Scientific Research</p></blockquote> <div class="quotesBottom"><img src="https://horizon-magazine.eu/sites/all/themes/horizon/images/quotes_bottom.png" alt="" title="" /></div> </div> </p> <p><strong>Truck platooning</strong></p> <p>Hoedemaeker and her project partners are now trying to break new ground by developing truck platooning that works across different brands as part of a project called <a href="https://cordis.europa.eu/project/rcn/216001/factsheet/en" target="_blank" rel="noopener noreferrer">ENSEMBLE</a>. ‘Now we’re going to show that we can do this together with all the European truck manufacturers,’ said Dr Hoedemaeker.</p> <p>The first phase, which the team has just completed, involved coming up with specifications that need to be implemented by all manufacturers. For example, braking and speed keeping will be automated whereas steering won’t be.</p> <p>They’ve also come up with guidelines for how a convoy will respond when it enters a zone with a new speed limit or passes a toll gate, for example. ‘It's not only communicating with the platoon but also with the outside world,’ she said.</p> <p>The team is also keen to gauge the impact that a platoon will have on traffic. They would like to calculate its effect on traffic flow and whether it would in fact reduce congestion on the roads. Driving simulators will also be used to see how other drivers react when they encounter an automated truck convoy.&nbsp; ‘Will it change their traffic behaviour or will they never drive in the right lane anymore? There are lots of questions around this other traffic behaviour as well,’ said Dr Hoedemaeker.</p> <p>Once specifications have been implemented in the trucks, they will start to test platoons on dedicated grounds then on public roads. Since trucks cross borders quite often, they will have to respect laws in different countries which vary across EU member states. The minimum following distance between vehicles, for example, differs from country to country.</p> <p>In a final showcase event in May 2021, trucks from seven different brands, such as Daimler and Volvo, will drive together in one or more convoys across national borders, most likely to a key goods transport destination such as a large European port.</p> <p>Following this deployment on European roads, Hoedemaeker expects the first generation platooning trucks to start being manufactured and sold a year after the project ends in 2021.</p> <p>Since platoons are being developed worldwide, the standards created during the project could also be adopted more widely.</p> <p>‘I think there is potential that the rest of the world could say they (Europe) already thought about the standards so we can use these and not do the whole thing over again,’ she said.</p> <p><em>The research in this article was funded by the EU. If you liked this article, please consider sharing it on social media.</em></p> <p> <div class="moreInfoBlock"> <h3>Connected and automated driving conference</h3> <p>The second EU conference on connected and automated driving (EUCAD) is due to be held in Brussels, Belgium, on 2 and 3 April 2019.</p> <p>It's part of the EU's efforts to promote research and innovation in automated vehicles, which also include funding of around €300 million between 2014 and 2020 under the Horizon 2020 funding programme.&nbsp;</p> <p>The idea of the conference is to bring together political leaders from across Europe and representatives from the automotive industry and road authorities to discuss the challenges related to automated mobility.</p> <p>One of the issues under discussion will be how to improve public understanding of connected and automated driving technologies with a view to increasing public acceptance and boost uptake.</p> <p>For more information, visit <a href="https://connectedautomateddriving.eu/eucad2019/">https://connectedautomateddriving.eu/eucad2019/</a></p> </div> </p> <br /> <img src=”http://www.google-analytics.com/collect?v=1&tid=UA-40077089-1&cid=a-‘cookbook’-for-vehicle-manufacturers-getting-automated-parts-to-talk-to-each-other&t=event&ec=republish&ea=read&el=a-‘cookbook’-for-vehicle-manufacturers-getting-automated-parts-to-talk-to-each-other&cs=republish&cm=republish&cn=republish&cm1=1" /> This post <a href="https://horizon-magazine.eu/article/cookbook-vehicle-manufacturers-getting-automated-parts-talk-each-other.html">A ‘cookbook’ for vehicle manufacturers: Getting automated parts to talk to each other</a> was originally published on <a href="https://horizon-magazine.eu/">Horizon: the EU Research &amp; Innovation magazine | European Commission</a>. They’ve also come up with guidelines for how a convoy will respond when it enters a zone with a new speed limit or passes a toll gate, for example. ‘It's not only communicating with the platoon but also with the outside world,’ she said. The second EU conference on connected and automated driving (EUCAD) is due to be held in Brussels, Belgium, on 2 and 3 April 2019. It's part of the EU's efforts to promote research and innovation in automated vehicles, which also include funding of around €300 million between 2014 and 2020 under the Horizon 2020 funding programme. The idea of the conference is to bring together political leaders from across Europe and representatives from the automotive industry and road authorities to discuss the challenges related to automated mobility. One of the issues under discussion will be how to improve public understanding of connected and automated driving technologies with a view to increasing public acceptance and boost uptake.